Research has shown that our brains are more able to remember things if given a visual. This graphic organzier is a way to teach students the parts of a complete sentence in a way they will remember. 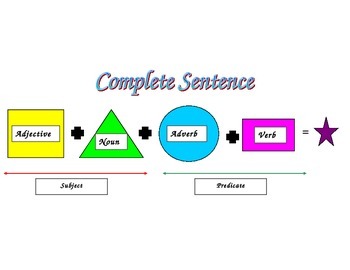 It's an easy way to introduce, as well as review the parts of a complete sentence. I have used it weeks after teaching it by doing something as simple as having them draw the graphic for me, just to keep it solid in their minds. I have seen many students doodle on their notebook paper when they are working on a writing assignment. Could also printed, laminated, and used as a desk plate! Easily modified for different levels of learners.